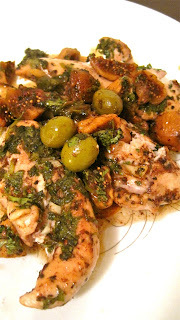 This recipe is one of my favorite chicken dishes: its simple to make but features robust and unique flavors, and the combination of figs and olive is perfection-just look at the popular NYC restaurant Fig and Olive, which features the combination in a bunch of its dishes. Its also a perfect example of the heart-healthy Mediterranean diet: the recipe features the LDL cholesterol lowering olive oil in both its natural and processed forms, and uses spices (the dried basil is key for this dish, don't skip it!) for flavoring instead of excessive salt. I pretty much stick to the recipe when I make this dish, however I did double the olives and figs per serving. Also, while marinating the chicken in advance definitely enhances the flavor, don't worry if you forget! Combine first 11 ingredients in a zip-top plastic bag. Seal and marinate in refrigerator for 4 hours, turning bag occasionally. As a monosaturated fat, olive oil has many health benefits. In addition to lowering bad cholesterol, it contains high levels of the powerful antioxidant polyphenols. The Mediterranean diet advocates replacing bad fats like butter and animal fats with mono and polysaturated fats (think canola oil and nuts) because they contain linolenic acid. This type of omega-3 fatty helps to moderate blood pressure, decrease sudden heart attack, and improve blood vessel health. "Mediterranean Diet: Choose This Heart-healthy Diet Option." Mayo Clinic. Web. 19 June 2010. <http://www.mayoclinic.com/health/mediterranean-diet/CL00011>. YUMMMMM. Yay for Tufts Health and Nutrition Newsletter! That looks incredible and I may try to replicate it - except as a stir fry on my stove. I think I might actually be able to make a decent version of your winter vegetable soup! I love how you include the health benefits in all the recipes - it gives me even more justification for eating way too much of my kvell-tastic faves like olive oil and kale. Keep it up Raq! !